12/01/1855 – Glasgow Herald – Royal Patriotic Fund, Lanarkshire – John McDonald, Gartverrie Brickworks £1. 10/06/1856 – Inverness Courier – 19/06/1856 – Deaths – At Bridge of Allan on the 10th inst, Mr John MacDonald of Gartverie Fire Clay Works. 25/06/1856 – Glasgow Herald – Notice to creditors – Parties having a claim against or due to the Estate of the late Mr John MacDonald of Gartverie Fire Clay Works are requested to lodge the same within eight days with Mr A.G MacDonald, 20 St Vincent Place, Glasgow. Below – 1858 – 59 – Gartverrie Fire Clay Works, Glenboig, Coatbridge. 1858 – 1861 – Ordnance Survey Name Books – Gartverrie Fireclay Works. Mr. Lang Manager. A tolerably sized Fire Clay Work the property of A.G. McDonald, Glasgow. 1869 – office – 62 Robertson Street, Glasgow. 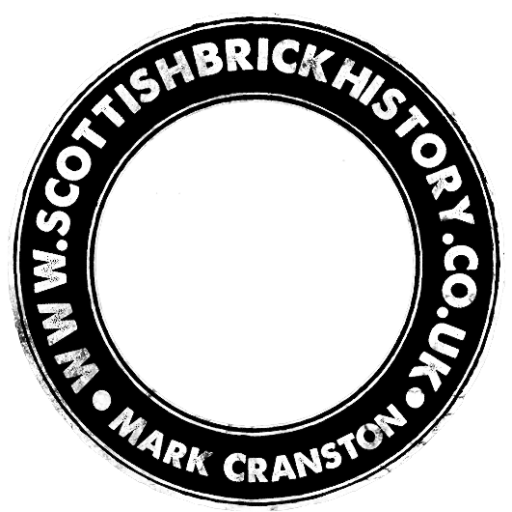 1872 – W. Lang, Brickmaker, Gartverrie Brickwork, Coatbridge. 1875 – Falkirk Museum has a quotation from the company offering silicate bricks at 57s 6d and firebricks at 42 s 6d per 1000, and ground fireclay at 5s 6d per ton. Silicate fireclay / Ganister was quoted at 8s per ton. 07/05/1880 – Dundee Courier – Accident on the railway. A labourer named William Johnstone was severely injured at Gartverrie fire clay works, Glenboig where he was employed. He had been engaged in shunting wagons when he stumbled and fell before the wheels, which passed over his right leg between the ankle and the knee, crushing it terribly. Johnstone was attended by Dr Wilson, Coatbridge who ordered him to be removed to Glasgow Royal Infirmary. 1882 – Gartverrie Fire Clay Co, Gartverrie. Office 62 Robertson Street, Glasgow. 31/08/1885 – Glasgow Herald – Mining exhibition and refers to The Gartverrie Fireclay Company being present. 31/05/1886 – Glasgow Herald – The International Exhibition refers to the Gartverrie Fireclay Works as exhibiting. Below – 1896 – Gartverrie Fire Clay Works, Glenboig, Coatbridge. 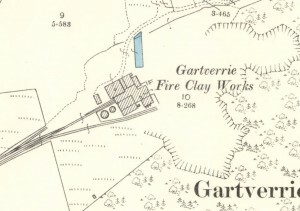 1896 – 1897 – Gartverrie Fire Clay Co, Glenboig. 21/10/1897 – Glasgow Herald – At the 15th annual meeting of the Glenboig Union Fireclay Company Limited there is reference to having in the past year acquired the works of Gartverrie. 25/01/1921 – The Scotsman – Reference to the Glenboig Union Fireclay Company Limited suing the Caledonian Railway. 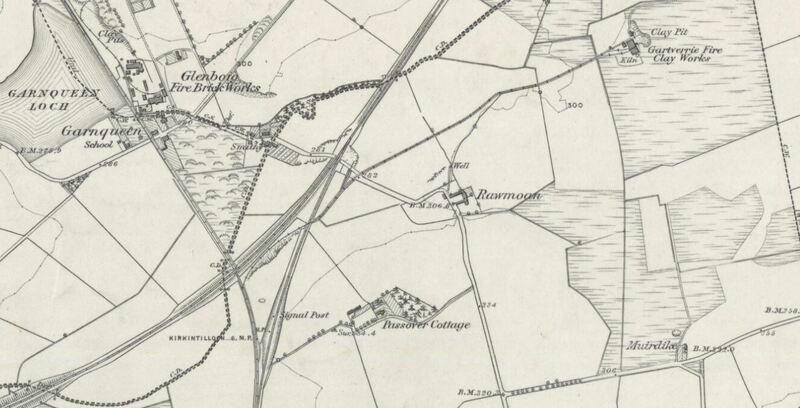 Also references that Glenboig was the lessee of the fireclay at Gartverrie from at least 1908. 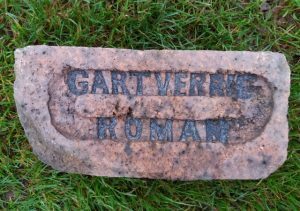 21/04/1921 – The Scotsman – Refers to the sale of the Gartsherrie Estate including The Gartverrie Fireclay Works and Quarry. 25/09/1931 – Motherwell Times – Deaths – James Craik Bishop of Barncluith, Hamilton, Writer of Glasgow, a partner in the firm of Milne, Boyd and Co and in the Gartverrie Fire Clay Company, a director of the Cadzow Coal Company and of CoatsTrades Hotel Ltd, a secretary of the Scottish Ironmasters Association, of the Scottish Manufactured Iron Trade Employers Association and of the Scottish Steel Founders Wages Association left personal estate in Great Britain of £24, 636.
c. 1939 Brick manufacture ceased. 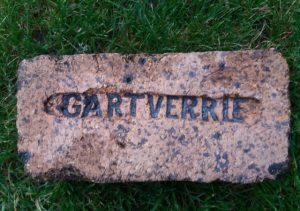 1939 – 40 – Gartverrie Limited, quarrymasters, brick manufacturers. 19 Waterloo Road, C2. Tel address Gartverrie Glasgow. 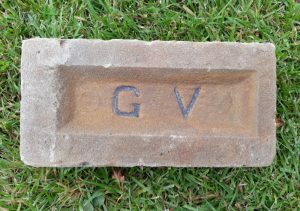 c. 1945 – The Company was bought by the Glenboig Union Company for £1,200 who used the sand for brick setting and supply to the local iron foundries. Some building bricks were made. 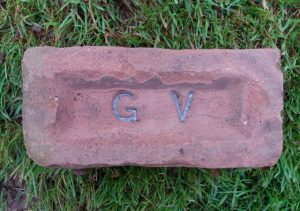 (Note – SBH – These are possible in reference to the bricks marked GV). 1950‘s – The Works were closed down. Found in Glenboig. Gartverrie Fireclay Works, Glenboig. The fireclay mine near Gartverrie was called Ramoan or Rawmoan. I imagine ‘Roman’ is a variation of the above. . .
Found at Dumbarton by DH. Note the thumb print above the ‘RIE’ Gartverrie Fireclay Works, Glenboig. . . .
Found flytipping pile, Glenboig This example is spelt with a single ‘R’ – why? Note the thumb print to bottom left. 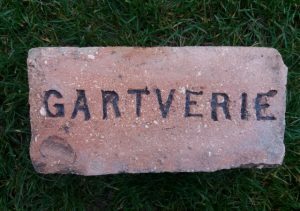 Gartverrie Fireclay Works, Glenboig, Lanarkshire. . . .